You are currently browsing articles tagged Palm Springs. Randy Grubb's Decoliner. Photo by David Lansing. We’d heard about the Vintage Airstream Trailers show during Modernism Week and headed over to have a look at the decked-out Caravels, Safaris, and Bambis. 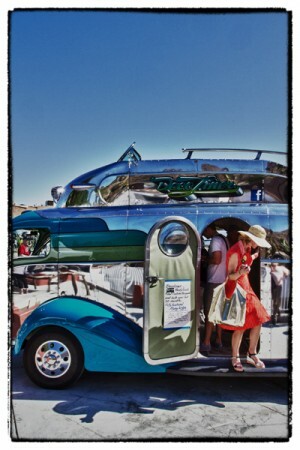 Our favorite, however, wasn’t an Airstream at all. It was Randy Grubb’s Decoliner, an odd beast that looked like a cross between a 50s bus and a hot-rod Globetrotter. Randy had driven the Decoliner, which has an open-top flying bridge (so it can be driven from either inside the cab or from on top of the roof), all the way from Grant’s Pass, Oregon, where he is a glass-blower when he isn’t messing around with cars. It took him 20 months to construct the beast which is made from a ’73 GMC motor home chassis, a 455 Oldsmobile engine, and a hulking 1950 COE (Cab Over Engine). This thing is just meant for a long road trip. 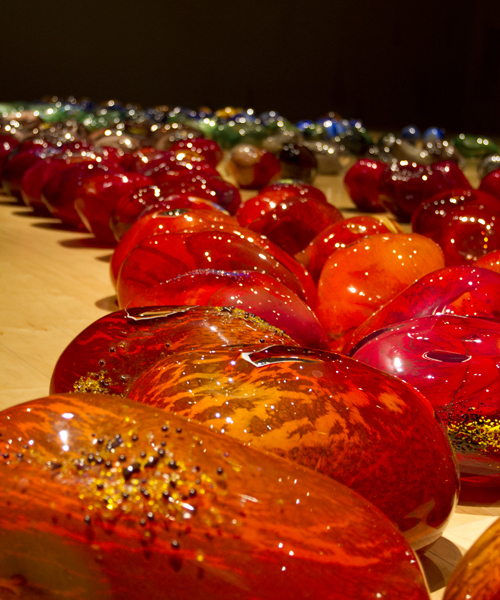 Some of the 250 hand-blown glass eggs in Michael Petry's art installation in Palm Springs. Photos by David Lansing. One other fabulous exhibit currently at the Palm Springs Art Museum: Michael Petry’s “The Touch of the Oracle.” The concept behind this is a little difficult to explain but let me try. 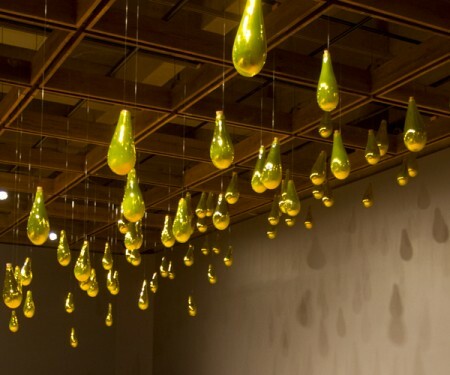 In a gallery with a blond hardwood floor, Petry has hung 100 gold mirrored droplet-shaped glass vessels that have something to do with the Greek myth of Danae, who was impregnated by the god Zeus in the form of a golden rain shower. So the 100 golden vessels are like sperm. On the hardwood floor are 250 hand-blown glass “stones” or, really, eggs. In short, the golden sperm hanging from the ceiling is preparing to impregnate the multi-colored glass eggs. Okay, the story sounds a bit lame, I agree, but the exhibit is really quite stunning. Even if you ignore the whole “golden-rain-impregnating-hand-blown-glass-eggs” thing. 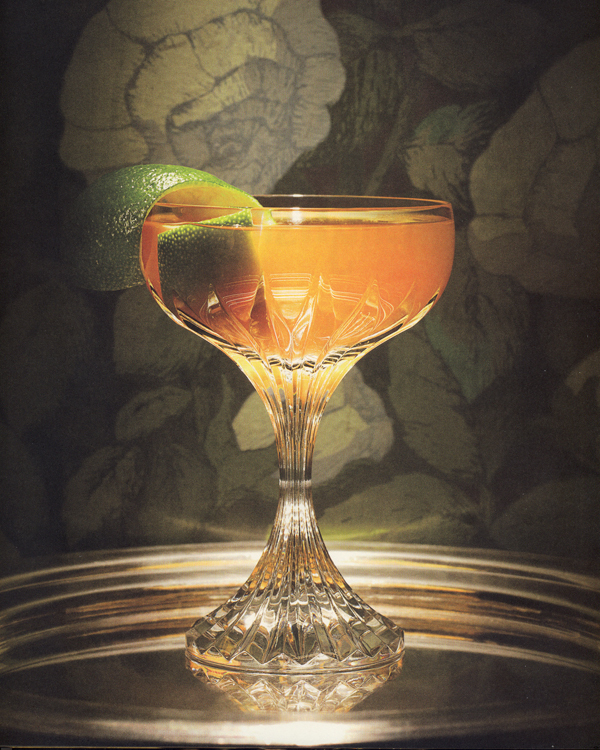 The Touch of the Oracle continues through July 29. 100 gold mirrored droplet-shaped glass vessels hang from the ceiling. David Hockney's "Sun on the Pool Los Angeles," a composite of Polaroids from April 13, 1982. It was the perfect Easter Sunday in Palm Springs: blue sky, mid-80s, and not a trace of wind. A day for either sitting by the pool or, perhaps, looking at pools in the form of a visit to the Palm Springs Art Museum to walk through their special exhibition “Backyard Oasis: The Swimming Pool in Southern California Photography, 1945-1982,” part of the Getty Foundation’s Pacific Standard Time exhibition currently running in more than 60 museums in Southern California. There was so much eye candy here but our favorites were the series of David Hockney Polaroid composites, such as the one above, comprised of dozens of individually shot Polaroids of a backyard swimming pool. 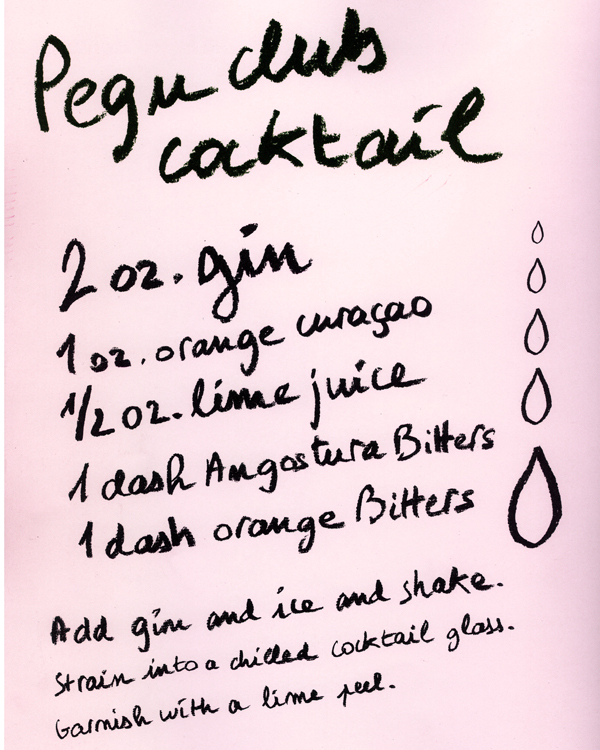 So very clever and so very entertaining. Backyard Oasis continues through May 27. 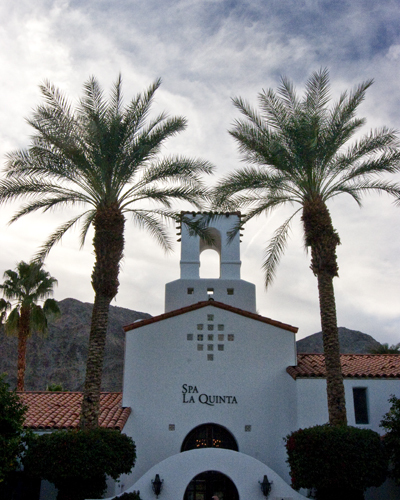 The Spanish Revival style is evident at the La Quinta Spa building. Photo by David Lansing. I mentioned that La Quinta was designed in the ‘20s by an unknown architect from Pasadena named Gordon Kaufmann. Actually, Kaufmann was relatively unknown when he was hired by Walter H. Morgan to design the resort, but he later went on to fame designing such California icons as the Los Angeles Times building, the Hollywood Palladium, and the infamous Greystone Mansion in Beverly Hills where Ned Doheny, the son of Edward Doheny, the oil tycoon, died in his bedroom of a murder-suicide with his secretary, Hugh Plunket (parts of the movie There Will Be Blood, with Daniel Day-Lewis, were not only based on the Doheny family drama but the finale, where the Daniel Day-Lewis character bludgeons the ersatz preacher, Eli Sunday, to death with a bowling pin was shot in the basement bowling alley of Greystone Mansion). Anyway, Kaufmann designed the cottages and offices of La Quinta Hotel (as it was called then) in Spanish Revival, though I don’t know that the style was actually called that back then. According to an architectural guide I have, Spanish Revival “refers to the architectural style that was popular from about 1915 to about 1940” and caught hold after the Panama-California Exposition in 1915. It also says that the growth of California and the film industry during the 1920s and 1930s facilitated the dissemination of this style. Well, that just about sums up the architectural style of La Quinta. It may, indeed, be a little eclectic looking but I find that, as I walk around, the buildings around the resort, from my little casita to the spa, are all quite pleasing to the eye—and charming. By the way, Kaufmann died in 1949 and while his obituary in the Los Angeles Times goes on and on about his design of an aircraft plant and the grandstand at Santa Anita Park, it makes no mention of one of his earliest and most indelible designs, La Quinta. Pity, that.